Present state: Demolished. An ice house in the goods yard survives. It has been restored and is Grade II listed. Notes: The Norfolk town of Great Yarmouth is a port town, with its riverside quays, and a holiday and day-tripper destination. Once most famously associated with herring fishing, this industry began to suffer from declining fish stocks from the 1950s onwards and was eventually killed-off altogether by European Union fishing quotas, Yarmouth's final trawler ‘throwing in the towel’ at the end of 2009. The quays also served other industries, most notably imported timber, while smoked fish was also exported. Yarmouth was once the largest herring port in the world. In more recent times the focus has been on the North Sea oil and gas industries while in the 21st century a new deep water harbour has been constructed which will hopefully go some way towards reviving the town's fortunes. The holiday industry has, as with most of Britain's seaside resorts, seen a serious decline since the 1960s but Yarmouth remains popular with day and weekend visitors. This is partly due to its proximity to Norwich but also to its being a large town among many smaller resorts dotted along the coast of Norfolk and Suffolk, many of which comprise camping and caravan sites, as well as the Norfolk Broads. It is no wonder, then, that the town was in its heyday a target for the railways and at one time the Great Yarmouth municipal area contained no fewer than eight stations and halts, of which three were termini. The area known as Southtown (The railways always spelled it South Town and this spelling will be used in the railway context) and also once known as Little Yarmouth, was at one time in the County of Suffolk and part of Gorleston on Sea. Gorleston on Sea became part of Great Yarmouth in 1835 and boundary changes saw the entire Great Yarmouth conurbation falling into Norfolk, the River Yare having previously formed the county boundary. 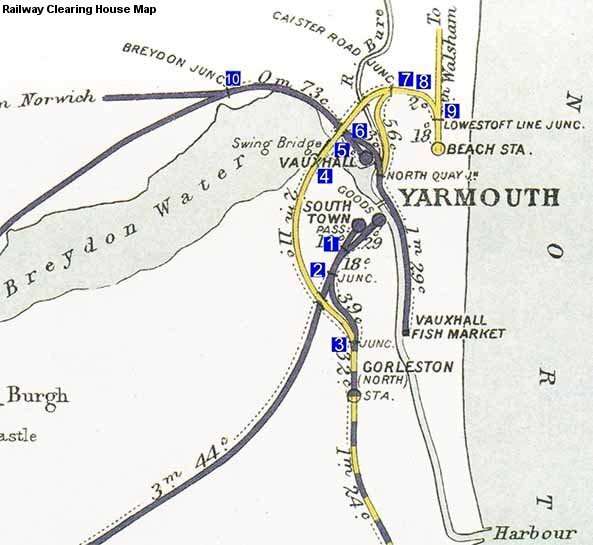 Yarmouth South Town station was always known as such and never carried the 'Great' prefix, in contrast to Beach station where the running-in boards announced ‘Great Yarmouth Beach Station’ until British Railways decided ‘Yarmouth Beach’ would suffice. Yarmouth's third terminal, Vauxhall, also lacked the 'Great' until British Rail began to apply the full name from 16 May 1989 and probably only because of the increasing use of computers. The practice of the railways dropping the 'Great' was not without its problems. For example, as late as 1962 a visitor from the USA arrived at South Town station and asked a policeman for directions to the ferry and a certain hotel. Baffled, the policeman made enquiries and it turned out the visitor should have been at Yarmouth, Isle of Wight; Yarmouth IoW station had by then been closed for a decade. The Great Yarmouth Mercury noted that this was not the only such incident. Although this work is concerned only with South Town, a number of junctions and signal boxes throughout Great Yarmouth have been mentioned out of the necessity to paint the full picture. For clarity and to place everything into context with South Town,.part of a 1912 Railway Clearing House map is reproduced here. Signal box locations have been superimposed and a key to the numbers in the blue squares is given below. The line into Beach station and via Breydon Water to Gorleston North Junction was M&GN and south thereof the Norfolk & Suffolk Joint to Lowestoft. All other lines were Great Eastern Railway. 1. Yarmouth South Town 2. Yarmouth South Town Junction. 3. Gorleston North (Sometimes referred to as North Gorleston Junction box). 4. Breydon South. 5. Breydon North. (Breydon South and North boxes controlled the single track over Breydon Viaduct. Both were abolished in 1928 with the introduction of track circuiting - see below). 6. Yarmouth Vauxhall Yard (Abbreviated on the box, at least in later years, to Yarmouth Vaux.) 7. Caister Road (Controlled quayside line). 8. Nelson Road (This was a level crossing box, on the M&GN link to Gorleston North). 9. Yarmouth Yard (Controlling Beach station and Lowestoft Line Junction). When Breydon South and North boxes were abolished in 1928 the signals and points at the swing bridge were controlled from Caister Road as was, with the exception of two signals, the entire line to North Gorleston Junction. The exceptions were controlled from Gorleston North box. Because of the presence of the swing bridge the entire line was in addition fitted with detonator placers working in conjunction with signals and controlled from Caister Road. Breydon Viaduct was 791ft long including the swing span which was 170ft long. The line towards Gorleston North was the Up line and towards Caister Road the Down line. From 1928 the Up line was track circuited from Caister Road to the swing bridge and the Down line track circuited from Gorleston North to the swing bridge. In addition, the single line over the swing bridge was also track circuited as were the otherwise not-so-fitted Up and Down lines for a short distance either side of the bridge. Yarmouth South Town, built under the Yarmouth & Haddiscoe Railway Act (YHR), had its origins with the East Suffolk Railway Company (ESRCo), which itself had been incorporated on 5 June 1851 as the Halesworth, Beccles & Haddiscoe Railway Company, becoming the ESRCo on 3 July 1854. This section, part of which survives as today's East Suffolk Line, opened to traffic on 4 December 1854. As was common practice it, like the YHR, never owned or operated trains and thus was one of a plethora of small companies set up to promote, finance and build railways across the country. The ESRCo. trains were operated by the Eastern Counties Railway (ECR) and the line was progressively extended by a number of additional Acts to reach Ipswich in the south and Yarmouth to the north. Necessary alterations at Haddiscoe saw the original section north of Beccles close temporarily on 17 May 1858, being replaced by a horse-bus service. On 1 June 1859 the Ipswich - Yarmouth South Town route opened in its entirety, as did the Lowestoft Line Junction (Beccles) to Oulton Broad (Lowestoft) section. The history of the railway at Haddiscoe is beyond the remit of this page but is a curious one which deserves a brief mention. What became Haddiscoe High Level on the South Town line began life as St Olaves Junction, became Herringfleet Junction in 1891 and finally Haddiscoe High Level in 1904. The present Haddiscoe station, formerly Haddiscoe Low Level, also dated from 1904 and was a replacement for the original Haddiscoe station located a short distance away and which had been opened by the Norfolk Railway in 1847. The original station also, of course, closed in 1904. Meanwhile the ECR was operating most of East Anglia's railways although a multitude of smaller companies, such as the ESRCo, continued to exist albeit often in little more than the legal sense. An example of the latter was the Eastern Union; this had merged with the Ipswich & Bury Railway in 1847 and was leased by the ECR in 1854. This all changed in 1862 when by Act of 7 August that year the ECR amalgamated with the ESRCo; East Anglian Railway; Norfolk Railway; Eastern Union Railway and their subsidiaries to form the Great Eastern Railway Company (GER). Although ‘amalgamated’ was the legal definition, the creation of the GER effectively meant the ECR, the largest of the constituents, simply took over the other companies which it had already been operating. Elsewhere in Yarmouth, Vauxhall station had opened on 1 May 1844 but at that time was served only by trains to and from Norwich - the present station, formerly Norwich Thorpe. Not until the following year was it possible to reach London (Bishopsgate) from Yarmouth via Norwich, the only route then possible and via Cambridge at that. Thus the opening of Yarmouth South Town with its potential for much more direct services to London was seen as a major triumph for the Norfolk resort and, in particular, its fishing industry. Despite this, South Town was not, and never would be, a large station and indeed for the first three years following opening the only service was that to Ipswich: a service of four trains per weekday with two on Sunday. Meagre by modern standards, this level of service was typical of the time in rural regions and considering that the alternative was a journey by horse along muddy tracks, perhaps occupying several days, the train service would not have been considered poor. These Ipswich - Yarmouth services divided at Beccles with one portion continuing to Lowestoft and this practice continued into BR days. Through trains between London and South Town did not appear until the GER came into existence; initially just one train per day, the GER increased the London service from 1883 but they were never frequent during the entire life of South Town station. The London terminus was initially Bishopsgate and then, from 1875, Liverpool Street. It is worth mentioning that the prefixing of the names of London termini with 'London', for example 'London Liverpool Street' is born out of the computer age. The practice is, unfortunately and incorrectly, being used more and more in the historical context. References now even exist to 'London Bishopsgate', which is utterly absurd. South Town station was located, as already described, in an area which had once been part of Gorleston and in the county of Suffolk. The station faced towards Haven Bridge (once also known as Southtown Bridge) and overlooked the junction of Bridge Road and Southtown Road. At the time of the railway’s existence the location was totally different from today, with Bridge Road heading west before turning south into Gorleston as Southtown Road. Station Road, today the only hint there was ever a railway in the vicinity, was and still is a little way along Southtown Road and ran roughly parallel to the railway. Wedged in between the station and Station Road is Plevna Road, many years later to become Plevna Terrace, and these are the houses which backed onto the railway at the south side of the station. The main station building, despite being quite small, was nonetheless impressive in its two-storey Italianate style. This building contained various offices and facilities on its ground floor, with stationmaster's accommodation on the first floor. The forecourt was spacious and had at its centre a rectangular garden surrounded by a low kerb. At some stage the station building end, at least, of the garden was rounded, presumably to accord with the flow of road vehicles. Other than to provide a pleasant environment, the garden appears to have been intended to encourage separate incoming and outgoing flows of passengers (the forecourt was at some point signed as such) as the station’s platforms were designed as Departure (Up) and Arrival (Down). This designation, insofar as the railway was concerned, continued to be used into BR days. The south side of the station contained various rooms, staff and public, which extended onto the southernmost platform (1 and 2, the Up island) and which are believed to have originally been waiting rooms and toilets. There were a number of changes in 1902, in connection with the due-to-open Lowestoft line, but for which no plans are known to have survived. Alterations implemented by British Railways in 1952 were extensive. Fortunately plans from 1952 have survived and details are included in image captions where they are easier to describe. Despite South Town station being quite small, railway-owned land until October 1902 was no less than 1,400 acres. The change during October 1902 was in connection with the yet-to-open Lowestoft line. The Great Eastern Railway had a reputation for looking after its employees and one example of this appears in GER records for 13 January 1875 and concerned the stationmaster's accommodation. As built, this accommodation provided three bedrooms, one sitting room and a kitchen; this imbalance between ground and first floors probably being accounted for by the presence of the stationmaster's office. In 1875 the stationmaster's family totalled no fewer than 11 people. No breakdown was given but the 11 probably included the parents of either or both the stationmaster and his wife plus a number of children, family living arrangements such as this were not uncommon at the time. To alleviate the crush, the GER agreed to provide an additional two bedrooms of which one appears to have been on the ground floor as a two-storey addition was grafted on to south side of the station building. It is for this reason that the front elevation of the building was thereafter very obviously asymmetrical. It is often incorrectly assumed that stationmasters were given free accommodation but this was not the case; a rental was payable and at South Town this would have increased following the additional rooms being provided, but even so the agreement for the initial expenditure showed what the company would do to assist its valued employees. However, ‘valued employees’ meant smart, honest and reliable employees and any misdemeanour could, and often did, result in instant dismissal. An example of this occurred when a booking office clerk failed to open the booking office on time (the reason was not recorded) resulting in a 23 minutes late train departure from South Town. The GER promptly dismissed the employee. Platform numbering, if any, during the early years is unclear and surviving records from that time imply that there were only two passenger platforms; Arrivals and Departures. However, at some point in time the platforms were numbered 1 - 4 from left to right when viewed from the station building, thus the original Departure platform was, or became, Platform 2 while the original Arrivals platform was, or became, Platform 3. In 1952 British Railways advised staff that Platforms 2 and 3 could accommodate eleven bogies while Platforms 1 and 4 could accommodate eight bogies. In this context 'bogie' means a bogie passenger carriage and/or non-passenger carrying vehicles such as parcels stock (GUV or BG vans etc.). However, eight or eleven bogies does not necessarily mean that all would be alongside the platform and total vehicles able to be accommodated also takes into account signalling and track layout. Part of a train might thus be out of the platform and standing beyond the Starter signal, a once common occurrence, and this is the reason for the provision of Advanced Starter signals. In the days prior to widespread use of corridor stock, passenger trains would, under normal circumstances, be required to have all vehicles at a platform face. Corridor stock in many cases negated this requirement and was the often the reason for what may seem at first glance to be mysterious alterations to track and signalling. Surviving records mention a number of such alterations at South Town throughout much of the station's life. Other facilities provided at the outset were carriage sidings and locomotive facilities including a two-road shed, water tower, water column and turntable. Locomotive facilities were on the Up side beyond the platform limits while the limited goods facilities at the station site (the goods yard was elsewhere and will be described later) appear to have jostled for space with the carriage stabling requirements. The finer details of the original locomotive facilities and in particular the turntable are something of a puzzle and unfortunately the relevant Minutes of the ESRCo. for the crucial period of the station’s construction appear not to have survived. The GER, however, recorded on 22 September 1869 that the, then, turntable had been responsible for a number of coupling breakages; presumably this referred to the couplings between locomotives and tenders. The suggested solution was to relocate the turntable at a cost of £50 but this was refused and thus no action was taken. The refusal to spend this small sum may suggest that the GER Board was minded to lay the blame for repeated broken couplings on locomotive crews but the proposed solution of turntable relocation suggests that the problem may have lain with the track layout. However one may interpret records, there was no further reference to the turntable until 1 February 1881 when an expenditure of £208 was agreed for a new turntable balance (this refers to the pivot). This did not go ahead, however, and during the same month an expenditure of £408 was recommended for a new 45ft locomotive turntable. The grey area is whether ‘45ft’ referred to a larger turntable or merely a like-for-like replacement of the original. A 60ft turntable was authorised in November 1914 and probably came into use during 1915, but it is the 1881 45ft turntable to which most historical references point. The broken coupling incidents were, in one sense, fortunate as they confirm that a turntable of some description existed prior to 1881 and whilst this may be obvious the finer details are less obvious. See below regarding the post-1914 period. South Town station and its environs underwent numerous alterations over the years. Among the many a few stand out; on 1 April 1884 approval for an expenditure of £960 was given for lengthening the platforms to 450ft. This high, for the time, sum of money would have included alterations to the track and signalling. It is significant because it may have also involved relocation of the locomotive facilities and thus have partly explained the turntable mystery. On 3 February the following year an expenditure of £580 was approved for the lengthening the Up platform road by 70ft to accommodate excursion trains. It should be noted that ‘platform road’ refers to the track and not the platform itself. The £580 would have included the cost of signalling and pointwork alterations and not just the lengthening of the actual platform road. The 1884 platform lengthening did not including extending the awnings; this improvement had to wait until April 1890 when £510 was spent on the work. Evidence of the platform lengthening was to remain visible, particularly on the platform facings, until the station was demolished in 1978. It would have been the 1884 platform lengthening which made the outer faces of the island platforms practical for use by passenger trains. The outer face of the Up platform terminated at the end wall of the block of buildings containing the waiting rooms and this road, although used by passenger trains at busy times, appears to have been largely used for parcels traffic and stock stabling. For a time, in late LNER/early BR days an ancient six-wheeled carriage in departmental use could be seen at the bufferstops. Returning to locomotive facilities for a moment, the previously mentioned 60ft turntable authorised in November 1914 was lumped in with a number of other alterations costing a total of £2,271. These included an extended siding (presumably for locomotives), provision of a pit, relocation of the water column (later stated by British Railways as being a ‘Type C’ column) and a number of related but unspecified additional minor alterations. This is the first confirmed evidence of South Town locomotive shed being provided with a pit and this may have been related to the aforementioned extended siding, although tracks running through locomotive sheds are normally referred to as ‘shed roads’. As far as can be determined only one of the two shed roads was provided with a pit and this would explain the wording ‘provision of a pit’ as opposed to ‘provision of pits’. Following these alterations, and if not previously, the turntable was entered from the Up line via a connection trailing in the Up direction. This road led back towards the station and ended a few yards beyond the turntable, directly opposite the end of Station Road. The locomotive shed was reached from the turntable road via points trailing in the Down direction. The shed was re-roofed as part of the 1952 improvements but only as a temporary expedient before being rebuilt completely in 1956. Also around the time of the 1952 improvements, and probably during 1951, a further and relatively little-known change to the locomotive turntable occurred when it was enlarged to 65ft. This was done to accommodate the Britannia Pacifics which were introduced as part of the BR Standard steam fleet in 1951. The Britannias were the only Pacific (4-6-2) type ever to be seen at Yarmouth South Town but their reign was short, being superseded from 1958 by the lumbering English Electric Type 4 diesels whose reign was, as events proved, to be equally short. August 1864 - Parcels lock-up to be installed. 22 October 1872 - extra carriage siding requested to eliminate carriage stabling in goods siding at a cost of £340. At the same time, expenditure of £250 was requested for a covered way. May 1876 - weighing machine installed (no further details were recorded but weighing 'machine' usually refers to parcels office equipment. The parcels office was located adjacent to the waiting rooms on the Up platform). February 1879 - siding for Messrs Clarke installed at a cost of £165. April 1880 - provision of a new office at a cost of £85 (purpose and location of office unknown). 3 July 1883 - enlargement of parcels office at a cost of £185. August 1884 - cab shelter approved. A shelter was also provided at Vauxhall at the same time, total cost £130. This accountancy presumably means that the same contractor provided both shelters under a single contract. 2 June 1885 - coal ground approved at a cost of £1,470 (located on the Up side and opposite the platform ends). 4 February 1890 - toilets addition at a cost of £37. October 1892 - provision of a dock at a cost of £60 (on the Down side and behind the station, at the end of the siding serving the maltings - there was also a goods loading gauge at this location). 2 October 1894 - telephone line provided between South Town and Liverpool Street at a cost of £175 (a telephone line, not a telegraph line). The routing was. for some reason. via Reedham and Fleet Junction (Fleet Junction was at Haddiscoe and the junction for a chord which once linked the Yarmouth and Norwich lines). The reference in February 1879 to the siding for Messrs Clarke is somewhat obscure. R H Clarke operated Waveney Flour Mills located on the extreme south side of the goods yard (on the other side of Southtown Road) and adjacent to the premises of Messrs Jewson and do not appear to have been rail connected. The conclusion is therefore that Clarke’s siding was located in the limited space adjacent to the passenger station. With regard to the dock, mentioned above, this was not a cattle dock. Cattle traffic was handled at pens situated on the south side of the station near the coal wharf. There was a drain, underground, from the cattle dock and which ran south of and parallel to the tracks leading to the goods yard. The purpose of the drain was for washing down the cattle dock and, presumably, the drain discharged into the River Yare: a situation which would not be tolerated today but at one time was quite normal. The earliest confirmed details of signalling at South Town date from as late as 1 March 1881 when Messrs Saxby & Farmer were awarded a contract worth £712 8s 4d. Details of signalling arrangements prior to this date have proved elusive. On 20 January 1903, in preparation for the opening of the line from Lowestoft, a further signalling contract was awarded to Messrs McKenzie & Holland and their equipment remained in use until 1967. On 13 July 1903 the line from Lowestoft opened to traffic. Often confusingly quoted as being the Norfolk & Suffolk Joint Railway, it was in fact a joint Midland & Great Northern Joint Committee (M&GN) and GER route overseen by the Norfolk & Suffolk Joint Committee (author’s italics), hereinafter ‘NSJ’. The NSJ had been set up in July 1898 and its jurisdiction was to become a fragmented affair. Originally it controlled the North Walsham (Antingham Road Junction) to Mundesley line and when this line was extended to Cromer, the Mundesley to Runton West Junction section. Thus the Lowestoft - Yarmouth South Town section created two jurisdictionally isolated sections. Even so, not all of the Lowestoft - Yarmouth line came under the NSJ; the 39-chain section between Gorleston North Junction (sometimes referred to as North Gorleston Junction) and Yarmouth South Town Junction (the point where the South Town - Beccles and Lowestoft lines diverged, plus the 41-chain Coke Ovens Junction - Lowestoft Central section were pure GER territory. By some sort of unofficial agreement, details of which remain elusive, the GER also apparently assumed sole responsibility for the 1-mile 53-chain section between Coke Ovens Junction and Lowestoft North station. Gorleston North Junction was the point where the M&GN link to Lowestoft Line Junction (just north of Yarmouth Beach station) diverged. The link passed over the South Town - Beccles line on a bridge, then crossed Breydon Water via the famous swing bridge, then crossed the River Bure before curving sharply southwards to Lowestoft Line Junction. Just east of the Bure bridge was Caister Road Junction which linked the M&GN to the quayside tramways. M&GN tracks joined GER tracks at North Quay Junction, where the tramway which served the well-known Black Swan coal yard diverged. These connecting lines meant that all three Yarmouth termini were linked, although to do so entailed a number of reversals and use of the quayside tramways. The connection between the Lowestoft line and Yarmouth Beach was known, for legal and contractual reasons, as the Lowestoft Junction Railway and the contractor was the well-known Henry Lovatt. GER records refer to a siding for Lovatt at South Town and in connection with the Lowestoft Junction Railway as early as 1 May 1900. A further entry, this time from 21 June 1904, gives the cost of the Yarmouth South Town Junction - Gorleston North Junction link as being £5,575 and presumably this figure included the cost of purchase of an extra 3¾ acres of land and the cost of signalling alterations which were carried out by Messrs McKenzie & Holland. Interestingly, earlier, in October 1902, the cost of the extra land was stated to be £2,000 with other costs at £4,270 totalling £6,270. The Lowestoft - Yarmouth line became arguably the biggest provider of passenger business to South Town station; double track and with generous intermediate stations, the lowest service level was eight trains per day but at its peak the service level was 20 trains per day and even at closure in 1970 there were 12 trains per day. The line was well used and continued to be until closure. Not all trains served South Town, however, and for a time a few trains avoided South Town and took the connecting link to Beach station which was somewhat more conveniently located for the town, racecourse and, of course, the beach. When examining the history of railway stations the means by which passengers got to and from stations is worth considering. At the time that South Town opened this would have been on foot or by horse-drawn road transport and from the later part of the nineteenth century the velocipede - various types of contraption which evolved into what we now call the bicycle. In 1871 the East Anglian Tramway Company obtained powers to construct a horse tramway between Yarmouth and Lowestoft on the standard gauge. For reasons which will shortly become clear, the northern terminus would have been - and as events unfolded was - outside South Town station. The following year powers were transferred to the East Suffolk Tramway Company, which had grander plans to extend south to Halesworth via Southwold. Details of the never-built section south of Lowestoft are complex and not relevant here but it is worth noting that the eventual outcome of the Halesworth - Southwold section, following a succession of other failed proposals, was the famous 3ft gauge Southwold Railway. Only a three-mile section between South Town station and Gorleston library was to be built and this opened on 25 March 1875. Some sources state that this line was built not to standard gauge (4ft 8½in) but to a peculiar 4ft 8in gauge but the truth, or otherwise, of this is difficult to determine. The 4ft 8in gauge was, nevertheless, not unknown, it being the original gauge of the Stockton & Darlington Railway, for example. In 1878 the tramway was taken over by the Yarmouth & Gorleston Tramways Co who in 1882 re-laid it to 3ft 6in gauge and extended the line at the Gorleston end. Eventually coming under the auspices of Great Yarmouth Corporation, in March 1905 the Corporation set about re-laying the track, still on the 3ft 6in gauge, and electrifying the route. Electric trams began serving South Town station on 4 July 1905. It is interesting to note that during re-laying and electrification the trams continued to operate, albeit supplemented by horse buses. On the east side of the Yare was the other section of Great Yarmouth Corporation Tramways. This section ran south from Caister and split into a number of routes within Yarmouth. This section was electrified and Corporation-owned from the outset. The two sections were never physically linked, the reason being Haven Bridge - located opposite South Town station. There had been a bridge at this location for centuries but until 1930 its lifting section was wooden, manually operated and unsuitable for carrying trams. The present (2017) Haven Bridge, a bascule bridge, is the 1930 rebuild and although this bridge could have carried trams it was never to do so and passengers wishing to transfer from one section of the tramway to the other, and indeed those wishing to access South Town station from the eastern section of the tramway, had to continue to cross Haven Bridge on foot. The reason was that the Gorleston section of the tramway was due to close in the same year that the bridge was rebuilt and it did so on 25 September. The eastern section of the tramway closed on 14 December 1933. Interestingly, electric trams on the Gorleston route, photographic evidence tells us, carried the destination 'Yarmouth Bridge' and not 'South Town'. Although Haven Bridge was to all intents and purposes right outside South Town station the destination 'Yarmouth Bridge' was technically correct as the tramway turned the corner between Southtown Road and Bridge Road, terminating in the middle of the road immediately by the bridge. Just yards from the terminus the tramway crossed the railway tracks, located on the south side of the bend joining Southtown Road and Bridge Road, which led from South Town station to the GER goods yard. This legally complex juncture of road, railway and tramway was obviously considered worthwhile. In 1920 Yarmouth Corporation purchased some ex-London General B type buses, three it is thought. These were the Corporation's first motor buses and were replaced by three further examples in 1925 which lasted until 1928. It is often said the B types were purchased with the intention of replacing the trams but it is unclear if this was in fact the case although they did operate over tram routes, supplementing the trams. At this time the B type, which comprised some 3,000 examples, was rapidly being phased out in London (thought to have last operated on the 39 route) and either scrapped or sold for further use elsewhere. Thus Londoners arriving at Yarmouth by train found they could once again travel on their city’s cast-offs which, incidentally, continued to carry their General fleet numbers. As described elsewhere here, there were limited goods facilities at and adjacent to South Town station while much of what did exist was cattle, coal, parcels and sundries. The goods yard proper was located on an awkward site bounded by Southtown Road, Bridge Road/Haven Bridge and the quayside. As described in the paragraphs concerning the tramway, there was a level crossing on Southtown Road at the southern end of the bend where Bridge and Southtown Roads met. The track passed South Town's cattle dock before passing along the south side of the station building, behind the waiting rooms via a gap between the latter and a stable block. The line then passed alongside, but outside the boundary of, the south side of the station forecourt behind the rear of Plevna Road where it was embedded flush with the surface but at this point some confusion exists. Having passed through this gap the line then split into two and this is confirmed by photographic evidence but one source, a plan drawn for inclusion in a book and supposedly showing the situation in 1904, shows the two tracks merging back into one before crossing Southtown Road. Plans drawn retrospectively for inclusion in books are not necessarily reliable evidence, especially when no source of information is given. In complete contradiction a plan produced for fire insurance purposes in 1909 clearly shows both lines crossing Southtown Road. We must remember, though, that both may be correct but for different periods. GER and LNER records are full of mentions of the goods yard but are silent on the matter of how many tracks crossed the road, or, more relevantly, any alterations to the level crossing. All goods yard descriptions here are based on the 1909 plans. Over the years, the goods yard expanded greatly in respect of the number of tracks so the likely scenario is one track crossing the road originally, with a second added at a later date. The tracks across the road and into the goods yard were sidings as opposed to running lines and whilst surviving records note numerous siding additions, extensions and alterations it has become difficult with the passage of time to determine to what the specific entries refer. Aerial photographs, which are among the very few known photographs showing the goods yard, without any shadow of doubt show two tracks crossing the road and the following information is therefore based on this. The Southtown Road level crossing was, as far as can be ascertained, of the ‘open’ type in the early years with road traffic controlled by a man with a red flag. At some stage, proper gates were provided and these were certainly in place by 1920. Locomotives were prohibited from crossing the road but surviving railway company records do not make clear where the changeover point between locomotives and horses, later tractors, was. However, from the track layout at the passenger station side of the road it is assumed wagons were pushed by a locomotive to the point where the tracks ran along the south side of the forecourt with alternative motive power taking over from there. This would certainly make sense when tractors replaced horses due to the tracks being embedded alongside the forecourt. Whatever the precise arrangements, the effect was the same and for the entire life of the goods yard a locomotive was never to be seen crossing the road. For many years shunting was, as already mentioned, performed by horses (a once very common practice) and Regulations stipulated that horses must be hitched to the front of wagons and not the side and, while crossing the road, preceded by a man with a red flag. In later years, an adapted tractor was used. Horses were kept in a stable block to the south of the station and facing the cattle dock. No details of the tractor have come to light but in all likelihood there was more than one and probably agricultural-type tractors fitted with heavy wooden beams at buffer height. The two tracks crossing the road were not Up and Down roads as per convention but two separate bi-directional sidings which effectively served two sets of sidings within the goods yard. However, by a complex system involving no fewer than 12 wagon turntables and much rigmarole, it was possible for all sidings to be reached from each other. The prohibition of locomotives crossing Southtown Road is interesting. From the modern-day perspective a road tractor could be called a locomotive, in the manner that certain types of steam traction engine were known as 'Road Locomotives'. One may therefore reasonably question why, if a road tractor was permissible over the level crossing, a small internal combustion railway locomotive, such as a Simplex, could not be used. The answer lies in the original Yarmouth & Haddiscoe Railway Act which contained the prohibition; at that time, the mid 19th century, 'locomotive' could be defined only as a railway locomotive for, apart from a handful of experimental and unsuccessful crude oddities, there was no other form of locomotive thus the definition of a locomotive as per the Act would remain for the entire life of the railway. In any event, South Town goods yard relied on a large number of wagon turntables and these were unsuitable for locomotives. Railway locomotives would, therefore, have been of only limited use even if they had eventually been permitted to cross the road. Having crossed the road outside the passenger station, the two tracks each fanned out into three sidings and these formed the main part of the goods yard. From these sidings, a number of others branched at a right angle via wagon turntables and from these branched further sidings running roughly parallel to the main sidings. On the north of the site were located two covered loading bays, the westernmost with a single siding reached via a cluster of four wagon turntables. The easternmost loading bay was attached to the goods shed which also had a single siding, this time entered via the same cluster of four wagon turntables at its west end and via a cluster of five at its eastern end. This shed was the GER’s Yarmouth South Town goods shed. East of the GER goods shed were a grain warehouse and a granary. Between these two buildings ran a single siding serving three warehouses, purposes unknown, situated on and orientated parallel to the quayside; a siding ran through these warehouses via another wagon turntable. There was a second wagon turntable connected to siding running across the south side of the site and also serving the quayside warehouses. Located on this latter siding was yet another wagon turntable serving a north - south orientated siding which also connected, via the cluster of five turntables, to the main sets of sidings and GER goods shed. This north - south siding split into two short sidings at its southernmost end served a drying room (for grain presumably) and slate storage area (presumably roofing slates brought in by ship). Of the two main sets of three sidings, the southernmost served another loading bay which, unlike the northernmost bay, was double ended. The GER goods shed dealt with, of course, general goods. The goods yard also contained a small coal compound plus some bunkers but this coal appears to have been for the goods yard’s own use; merchants’ coal facilities were, as we have seen, adjacent to South Town station. The yard also contained an ice house, squeezed into the north-east corner of the site adjacent to Haven Bridge, with a 73ft quayside frontage. There was another such building at Vauxhall and both appear to have had limited usefulness as from the first decade of the twentieth century they spent periods in use as a coal store at Vauxhall, and grain store at South Town. During the summer of 1906 an interesting situation developed between the GER and Yarmouth Corporation, the latter having drawn up plans for the reconstruction of Haven Bridge which, had it gone ahead, would have made an incursion upon the goods yard and involved taking much more land from GER than originally proposed [implying that the 1906 plans were a revision of an earlier scheme], including land on which GER proposed to erect shops, the ice house, including its 73ft river frontage, the outwards loading shed, the greater part of the goods shed, several of the existing [wagon] turntables and sidings. The cost of finding alternative land for this was estimated at £11,000 - £12,000 and the Corporation could not give the GER any land now occupied by old bridge approaches. The value of the land GER was asked to give up was only £6000; even if the GER only spent the proposed £100,000 they would be liable for rates of £1475 per annum, which capitalised @ 3½% would equal a contribution of £42,142 towards the cost of the bridge. The GER Board resolved to disapprove of the Corporation’s scheme and it was to be a further two decades before the bridge was rebuilt. Two curious points stand out: first of all, had the Corporation been able to give the GER land occupied by the old bridge approaches it is difficult to see how rail vehicles could have reached it (the land would have been to the north of the present Bridge Road); and secondly, the word ‘only’ in respect of the proposed £100,000 spending was as recorded by the GER Board and in 1909 this was a phenomenal sum of money which with the passage of time is difficult to account for. In all probability it was the sum which would have been required to purchase new land, demolish buildings, compensate their owners, pay legal fees and so forth. To put it into perspective, fifty years earlier the entire railway site at South Town, including the passenger station, had cost in the region of only £25,000. Other than general goods dealt with at the GER goods shed, one of the largest users of the goods yard appears to have been Messrs Jewson. A number of records survive concerning their sidings and additions or alterations to them with, in at least one instance, costs being divided equally between Jewson and the GER. Jewson’s business was mainly timber at the time, today the firm is concerned with all aspects of the building trade. In 1909 Jewson occupied much of the south side of the goods yard. Evidence suggests that in later years Jewson occupied much of the quayside area within the goods yard and this was certainly the case by the 1950s as photographic evidence survives. All goods facilities were withdrawn from South Town (station area) on and from 6 November 1967, the goods yard having closed in January of that year. Adjacent to the level crossing that provided access the goods yard and looming over the pavement of Southtown Road once stood an impressive train departures indicator board. It had a central section on which advertisements were placed, either side of which were the departures; weekdays towards the top and Sunday towards the bottom. The board was made still grander by an ornate, full width pediment. From the only known surviving photograph it appears that the departures were listed not by printed timetable sheets but by small cards inserted into a framework. Probably of GER origin, it disappeared sometime in early BR days. South Town station was gas lit from the outset, with gas supplied from the Gorleston & Southtown Gas Works built in 1854 and thus predating the railway. With Great Yarmouth (which after 1835 included Gorleston) split by the River Yare, there was a second gas works on the east side of the river and not far from Vauxhall. Both works closed in the mid 1960s, gas thereafter being piped from Norwich. Surviving ECR and GER records are littered with wranglings over the cost of gas and not just concerning South Town but across the entire system. As part of the 1952/3 improvements, the station gained electric lighting. Beneath the platform awnings a generous number of pendant lamps were provided; rectangular, metal framed and with some sort or translucent acrylic shading. These lamps were to an LNER design and given the date may have been new ex-stores - at this time BR had yet to decide on any standardised design of lighting. The lamps at South Town bore the station name with YARMOUTH on a top line and SOUTH TOWN in smaller size on a second line. It is often forgotten that the removal of the train shed required extension to the awnings in form of replacement. This was achieved by simply renewing the entire awnings, an alteration which gave the platforms that austere look of ‘Southern Railway 1930s’ for which it was well known during its final years. Open air sections of platform were graced with, or disfigured by depending on one’s point of view, concrete standards supporting shaded fluorescent strip lamps set at a right angle to the platform edges. These lamps were an early BR design and differed from the more ‘streamlined’ version eventually found across the network in that the strip lights were supported at each end as opposed to having a single, central mounting point on the underside. These lamps also carried the station name, this time in a single line, but over time it weathered and became extremely difficult to see. By the time that South Town was reduced to a single track unstaffed halt the fluorescent lamps had been removed from their standards but many of the pendants survived until the end beneath the Down Platform awning and one or two survive in private collections. The station building and circulating area was also given fluorescent strip lighting but of the suspended type. Following the closure of South Town, some of the redundant strip lamps appeared soon after at rural stations in Norfolk and Suffolk to replace oil lanterns, and they looked quite inappropriate; one of the ‘Disused Stations’ team recalls seeing one in use at Somerleyton with ‘Yarmouth South Town’ incompletely erased. A further aspect of the 1952 improvements concerned the signage on the station frontage. In LNER days this announced 'SOUTH LNER TOWN' with LNER in slightly larger letters. British Railways decided to pull out all the stops and, befitting a seaside town, install neon signage. A drawing dated 6 June 1952 survives, with the neons to be supplied by Claude General Neon Light Ltd. This was one of the big names in the field and held many patents. The new signage announced BRITISH RAILWAYS on the top line and, in larger letters, YARMOUTH SOUTH TOWN on the bottom line. This signage remained in situ until shortly before the station was demolished, including when the building graced a rather garish 'Santa Fe Ltd,' sign (Sante Fe was the North Sea oil and gas company which occupied the premises for a few years after closure). At some point, and possibly as a further part of the 1952 improvements, a combined refreshment and waiting room was added. This was an incongruous single-storey structure added to the north side of the station building and no attempt was made to blend it with the existing architecture. Its purpose was announced by the word 'Refreshments' in raised metal block capitals overlooking the forecourt and reminding one of the sort of thing once commonly seen at bus stations. It remains unclear if this refreshments room replaced a facility elsewhere on the station or if it was a totally new addition, but either way the waiting and refreshments combination was certainly a new addition. The East Coast is well known for its floods and South Town, goods and passenger, was affected in 1921, 1953 and again in 1954, the floods of the latter year being somewhat less known. If floodwater was not enough, during WW2 Great Yarmouth became a target for the Luftwaffe. On 7 May 1942 a 500kg bomb fell on the station but failed to detonate. It was defused by a Royal Navy bomb disposal operative who happened to be at the station awaiting a train. During the same year South Town signal box was damaged by a bomb. The box was rebuilt in 1943 and the modern-looking flat roofed structure is that which virtually all photographs depict. The only known surviving South Town signal box diagram also dates from the time of the rebuild. As an interesting aside, the German OKW (Oberkommando der Wehrmacht - the Supreme Command of the Armed Forces) came into possession of a number of photographs of the railways at Great Yarmouth, although such were not difficult to obtain even during the war. It is worth noting that during WW1 Great Yarmouth fell victim to Zeppelin air raids. Zeppelins L3 and L4 set out from Germany, the intention being to attack Humberside but bad weather scuppered this plan and bombs and incendiaries were dropped on Great Yarmouth instead. Some damage was done to quays, among other places, but as far as is known South Town station escaped. The zeppelins caused three deaths, among whom was Samuel Alfred Smith. Mr Smith was the first British civilian to be killed by an air raid. During 1943 the LNER looked at what they termed an ‘amalgamation’ of the stations within Great Yarmouth. The LNER was probably looking towards post-war economies as in 1943 the threat of a Nazi invasion was looking all the more unlikely and the defeat at Stalingrad in February 1943 signalled the beginning of the end of the Third Reich. The LNER’s scheme never reached fruition, of course, but had it done the changes are likely to have taken place in 1947 and would have seen the end of Yarmouth South Town. The scheme would have seen a new chord built east of Breydon Junction to divert trains from Norwich onto the connection from Gorleston North Junction and thus into Beach station. The situation with the Beccles line is less clear; a new chord would have been installed east of Belton to divert trains onto, again, the connecting link from Gorleston North Junction or closure may have been considered. Either way the winner would therefore have been Yarmouth Beach, with South Town and Vauxhall both closing. Whilst on paper the scheme was perfectly sensible, Beach station was reasonably convenient and had a connection to the quayside tramway, the finer details were more problematic. One problem was accommodating goods traffic while another was the single-track swing bridge over Breydon Water. The swing bridge was the second span, from the south bank, of a five-span Pratt Truss viaduct and the entire structure would have required hugely expensive rebuilding. Funding for this would not have been easy to justify among the many other spending necessities of the rundown postwar railway network. In the event the line over Breydon Viaduct was to close on 21 September 1953, supposedly because the viaduct required extensive repairs - dubious given that the viaduct was barely 50 years old, and Yarmouth Beach succumbed on 2 March 1959. During the 1950s South Town saw the named train ‘The Easterling’. This ran non-stop from Liverpool Street to Beccles where, as with many other trains, it divided into portions for Lowestoft Central and Yarmouth South Town. A restaurant car train, its timing were Liverpool Street dep. 10.33am, arr. Beccles 12.57pm, arr. Yarmouth South Town 1.22pm and Lowestoft Central 1.24pm Monday - Friday. On Saturday these timings were 11.03am, 1.18pm, 1.42pm and 1.44pm respectively. In the Up direction timings were South Town dep. 7.10pm, Lowestoft Central dep. 7.10pm, Beccles dep. 7.35pm, arr. Liverpool Street 10.00pm. The train had a headboard bearing the name and two heraldic devices, presumably those of Yarmouth and Lowestoft. Unfortunately the name ‘Easterling’ sounded like a duck while in addition the Easterlings were a fictional race perhaps best known from The Lord of the Rings. In actuality, The Easterling is a popular walk from Oulton Broad to Lowestoft Ness, the most easterly point in Britain. As we have previously seen, locomotive facilities at South Town were basic and the sort of thing one might have expected to see at the end of a branch line where one or two locomotives were kept overnight. The GER coded the shed 'YAR' and so it remained until 1 February 1950 when British Railways Eastern Region coded it 32D and thus it was a sub shed of Norwich Thorpe, 32A. Small shed it may have been but it nevertheless had a surprisingly long list of locomotives on its books from LNER days until closure although many did not stay long before being reallocated and replaced. Tank locomotives ranged from 0-6-0 and 2-4-2 types up to the chunky L1 2-6-4Ts while tender locomotives ranged from 0-6-0 up to 4-6-0 types and among the latter, at various times in both disfigured and standard form, were the two streamlined B17s once used on the 'East Anglian' named train. In addition three Britannia Pacifics, 70002/12/30, were also on South Town's books. Of those, No.70030 stayed for ten weeks but the other two soon got fed up and stayed a mere three weeks. South Town shed also had a number of diesel shunters on its books, some of which managed to stay for a few years. All were 0-6-0 Diesel Mechanical types of Drewry and Hunslet origin, latterly classes 04 and 05. The Hunslets came to be associated with the Scottish Region and the Isle of Wight at which latter a sole example, D2554, resided for many years, but the type was once a common sight in East Anglia together with the three 0-4-0 versions, D2950 - 2, which once haunted Ipswich Docks. South Town shed closed to steam on 2 November 1959, the same day as the line from Beccles closed (the Haddiscoe LL - Aldeby via Fleet Junction section remained open for freight until 28 December 1964). Thereafter main line diesels were stabled, but not allocated, while a handful of diesel shunters remained allocated. Total closure came officially on 30 June 1962 although a couple of diesel shunters, D2212 and D2571, were not officially transferred away until 14 July 1962 in effect making this the actual closure date. The reason they stayed on, if they did, is unknown but they may have been involved with track-lifting on the link over Breydon Water which was being undertaken around this time following almost a decade of disuse. The presence of main line diesels after 1959 was due to the diversion of trains from Ipswich and Liverpool Street via Lowestoft and freight workings. Locomotives types seen at South Town post 1959 were Brush Type 2 (later Class 30/1), BR/Sulzer Type 2 (later Class 24) and occasionally BTH Type 1 (later Class 15). The North British Type 2 (later Class 21) would also have appeared during the brief period Ipswich shed was lumbered with a few of these machines. Photographs of main line diesel locomotives at South Town are not rare and a few appear with this feature, but from the 21st century perspective it is a pity that, at the time of writing, no photographs of diesel shunters had come to light. Passenger train services of the early years have already been touched on, so an overview covering later years would be in order. The January 1948 Bradshaw shows six Liverpool Street - South Town trains weekdays with just one Up train on Sunday. One of these trains operated via Norwich Thorpe and Lowestoft Central; a rather convoluted journey involving reversals at Norwich and Lowestoft. There were also local services to and from Ipswich; these ran roughly every two hours on weekdays with alternate trains being all-stations. Sunday offered just one such train in each direction. Ipswich local trains generally joined or divided at Beccles with a portion to and from Lowestoft Central, a locomotive lurking at Beccles for the purpose. In addition there was an infrequent push-and-pull service between Beccles and South Town, the timings for which suggest its purpose was mainly schoolchildren and workers. Other than in timetables, references to this service are rare but when they do appear the service tends to be misdescribed as operating only to and from Haddiscoe High Level. On the Lowestoft - Yarmouth line the local service in 1948 was dire with just three trains each way per weekday and none on Sunday. Intending passengers were advised that these trains were 'One Class Only', suggesting it was a push-and-pull service (the South Town - Beccles Push & Pull was similarly so-classed). However, things were perhaps not quite as dire as other services ran to/from or via Yarmouth Beach but, of course, these avoided South Town. Among them was a train from Birmingham (New Street) and another to Leicester (London Road). Whilst the service level of 1948 may appear poor, it should be remembered that train services were only just beginning to be revived following WW2 when many passenger services were curtailed. The March - April 1961 Bradshaw makes an interesting comparison to 1948 as by then the South Town - Beccles line had closed. South Town - Ipswich locals continued to operate but via Lowestoft and this added, depending on the number of stations called at, around half an hour to the journey times. These trains were all booked for diesel multiple units (DMUs) from Ipswich depot. There was a small improvement in South Town - Liverpool Street services which of course all now operated via Lowestoft were a reversal was necessary; this was achieved by a change of locomotive, leaving the incoming locomotive to be released and returned elsewhere later, which is the reason why smaller diesel locomotives which did not normally work passenger trains from/to Liverpool Street appeared at South Town. The train which in 1948 operated via Norwich Thorpe and Lowestoft Central also continued to run, the 1959 closure of the Beccles route having no consequences for this train. By 1961 the South Town - Lowestoft line had a vastly improved service as in addition to Ipswich and Liverpool Street trains there was also the local service calling at all stations albeit generally only every two hours while on Sunday no trains called at intermediate stations Lowestoft North - Gorleston on Sea inclusive. Readers should bear in mind that the 1948 and 1961 timetables referred to did not cover the much busier summer period when on Saturday, the traditional 'changeover day' when holidaymakers would leave for home while those for the following week would arrive, as many as eight trains to and from Liverpool Street would appear at South Town with, post-1959, as many as 20 trains per day in each direction traversing the Lowestoft line. We should not forget excursion traffic either and these ran frequently during the summer. Adding to this the traffic to Vauxhall and, until 1959, Beach, we get an idea of just how popular a resort Great Yarmouth and its surrounding area once was. The decline was only in part due to people buying cars and sticking their noses in the air as a result, but mainly due to holidaymakers preferring instead to holiday abroad; a trend later boosted to a degree by Freddie Laker and, more so, by the appearance of ‘budget’ airlines and the European Union. Whilst Vauxhall remained busy with local services from Norwich and, during summer, beyond, South Town was reduced to only the local service from Lowestoft. Regular timetabled through services to/from Liverpool Street via Lowestoft had been withdrawn in June 1962 (immediately prior to the summer holiday season; this practice occurred on numerous lines and was done to counter the perceived increased losses resulting from the required extra trains and staff during the summer) and diverted to run to Vauxhall. A number of summer specials and excursion trains did, however, continue to serve South Town until 1964 during which year nine such trains ran on Saturdays. In September 1966 the line became Conductor-Guard operated, a type of working known by the Eastern Region as ‘Paytrain’, with all stations from Lowestoft North (inclusive) to South Town (inclusive) becoming unstaffed’ halts’ – though ‘Halt’ would not be added to their names - and the track was singled as far north as Yarmouth South Town Junction during 1967, being completed by November and on the 6th of that month the freight service to Lowestoft North was withdrawn. This was the same day that freight was withdrawn from South Town. The BR Eastern Region timetable for March 1967 - May 1968 shows 12 trains each way on Monday-to-Saturday with an additional early afternoon train on Saturdays 27 May - 9 September. This service level remained until closure but with some re-timings. There was no Sunday service. For many years the usual DMUs on the line were the Metro - Cammell 79xxx sets; apart from seven sets used in the Manchester area and which differed in detail to the remainder of the type were peculiar to East Anglia, being based at Cambridge, Ipswich, Norwich plus a couple at Stratford. These units had all gone from passenger service during 1969 and from 1968 Blue Square units became increasingly common until taking over completely for the last year or so. The East Suffolk Line is well known for being listed for closure in the Reshaping of British Railways, better known as the ‘Beeching Report’ (hereinafter the ‘Report’), but as with any official documentation a mere cursory glance does not always paint the full picture for the simple reason that ‘line closures’ do not necessarily mean the same as ‘withdrawal of railway passenger services’. In the case of the East Suffolk Line, the passenger train service proposed for withdrawal was stated in the Report as being Westerfield [exclusive as it was to remain open for Felixstowe services] to Yarmouth South Town [inclusive] – writer’s parenthesis. By this time, of course, Yarmouth South Town could be reached only via Lowestoft Central so the proposed withdrawal of the ‘Westerfield to Yarmouth South Town’ services did not include the closure of Lowestoft Central as this station was, and still is, also served by trains from Norwich. Thus while the layman of the time might assume that the withdrawal of the Westerfield - Yarmouth South Town services as stated in the Report - had he have had access to it - would include closure of Lowestoft Central this was of course not the case. As happened across the country, public notices of the intention of ‘Withdrawal of Railway Passenger Service’ notices made clear which stations were involved and which were not, as indeed did a separate section of the Report listing individual station closures - hence the reason official documents such as the Report should be studied carefully. Whilst the previous paragraph concerning closure of the East Suffolk Line is only semi-relevant to South Town, a British Railways Board document from July 1965 concerning the proposal to withdraw passenger services between Ipswich and Lowestoft Central and between Saxmundham and Aldeburgh makes interesting reading as it included sample passenger figures to and from Yarmouth South Town. The document is lengthy so only a few extracts from October 1964 are given below. The writer has simplified the information by giving train details with passenger figures applicable to South Town in brackets. The document makes no mention of stations Lowestoft North to Gorleston on Sea inclusive so passenger figures applicable to South Town probably include those to and from the aforementioned intermediate stations. The BR figures are merely presented as 'On train when departing Lowestoft Central' (Down direction) and 'On train when arriving at Lowestoft Central' (Up direction). At the time the document was produced, the Down direction was still towards Yarmouth South Town but would be reversed in 1968. Representative Weekday w/e 10 October 1964. Specifically which weekday it was is unstated. See note below. 07:10 ex Ipswich (92) 08:22 ex South Town (32) This train terminated at Beccles. Note: There are other weekday statistics available from the following month, the survey being undertaken on Tuesday 3 November. On that day what is specifically named as the ‘Yarmouth S.T line’ generated a mere 77 passengers (of which 62 commenced their journey on the line). Of those, ticket sales were to or from Oulton Broad South (11), Beccles (39), Halesworth (4), Wickham Market (1), Woodbridge (1) and Ipswich (11). Of the remaining 10 passengers, three were to or from stations south of Ipswich while the balance of 7 was to/from Liverpool Street or beyond. To place the South Town lines (which in this case means stations Yarmouth South Town - Lowestoft North inclusive) 77 passengers on that day into context, other stations on the East Suffolk Line saw a collective total of 2,145 passengers. Worse, for the South Town line, is that on the same day even the Aldeburgh branch managed to rustle up 128 passengers. Representative Saturday 10 October 1964. From these samples it will be seen the Monday to Friday and Saturday times were the same but trains on the section to and from South Town, but excluding Lowestoft Central, could vary significantly in passenger loadings. Compare, for example, the weekday figure for the 15:00 ex South Town service to those for the same train on the Saturday. All bar three of these trains were booked for DMUs. Even more dramatic is a comparison of the weekday figures recorded during the w/e 10 October 1964 with those of Tuesday 3 November 1964. The reason was probably the clocks altering to GMT on 25 October that year, an event which many people incorrectly view as the beginning of winter and change their habits accordingly - not so much today, with people out and about year round regardless, but very much so half a century ago. Representative Sunday 4 October 1964. All Sunday trains were DMUs. October was of course outside the Great Yarmouth holiday season and passenger surveys undertaken at quieter periods were and still are subjected to much criticism. However, many critics of Dr Beeching’s Report fail to see that the practice was perfectly reasonable. The British Railways Board’s remit, and thus that of Dr Beeching, was to attempt at least to ‘balance the books’ and the reasoning was that if lines and/or the services which operated over them could pay their way or at least break even during quieter periods then they were viable year round. Given the state of BR’s finances at the time, supporting train services at quieter periods by the extra revenue from busier periods was not an option. Contrary to popular belief, Dr Beeching did take into account ‘Social Hardship’ but the issue was swept under the carpet by provision of ‘adequate’ existing or replacement bus services, even though such were usually much slower and could not carry large amounts of luggage etc. Fortunately the East Suffolk Line Ipswich - Beccles - Lowestoft is still with us today while the Aldeburgh branch still operates for nuclear traffic as far as Sizewell (Leiston). Yarmouth South Town and the lines serving it are, of course, now only memories. Ditto but from No2 Platform 2 short, 1 long. Ditto but from No3 Platform 3 short, 1 long. Ditto but from No4 Platform 4 short, 1 long. To or from Goods Yard and Main [Line] 1 short, 2 long. To or From Engine Shed and Station or Goods Yard by siding next [to] Up Main [Line] 1 short, 3 long. Despite the abolition of steam in favour of diesel and electric traction the term ‘Whistle’ continues in use to this day, modern trackside signage usually displaying a simple ‘W’. P - Passenger, Parcels and Miscellaneous. F - Furniture Vans, Road Vehicles and Machines if wheeled. H - Horse Boxes and Prize Cattle. The mention of ‘Carriages’ in Group C refers to non-motor road vehicles. Group C vehicles would be carried on or in suitable non passenger carrying stock attached to passenger or parcels trains although small carriages could sometimes be accommodated in parcels vans alongside other items. Oddly the list did not include coal and coke traffic which, when it did, was coded ‘G*’. Nevertheless South Town did possess a coal yard, referred to as the ‘coal wharf’, on the south side of the site parallel with and adjacent to Station Road from which it was presumably reached. The earliest map which has been seen and which shows the facility dates from 1928, by which date the sidings south of the running lines had been expanded. This does not, however, mean there were no coal facilities prior to this date but only that earlier maps and railway company documents are silent on the subject. Locomotive coaling facilities, such as they were, were separate and appear to have been little more than hand-coaling direct from wagons. A not inconsiderable amount of the domestic coal traffic at Yarmouth was handled by yards approached from the quayside tramways such as White Swan. The list of codes given above applied to all three Yarmouth termini, whilst the ‘G*’ code was applied only to the quayside tramways. Goods traffic was withdrawn from South Town during November 1967 and South Town signal box closed at the same time along with the sole survivor on the Lowestoft line at Lowestoft North. From 1964 to 1967 South Town presented an odd sight for passengers on the DMU: the station was decrepit, the rear of the station building overlooking the circulating area at the platform ends was hideously sheeted over with corrugated iron and many fixtures and fittings had been removed. Most track remained in situ, rusty and becoming weed infested, with the Lowestoft DMU using a single platform - normally the former Down, or arrivals, platform. Passengers were required to use a rather depressing side entrance on the north side of the station. Thus entering and leaving South Town the DMU rattled across rusty and weedy tracks to and from what had been Yarmouth South Town Junction. Anybody who remembers this will attest to it being a very depressing sight indeed but one which was all too common during the 1960s. During the spring of 1968 much of the remaining track at South Town was lifted with one of the locomotives used known to have been Brush Type 2 D5580. A few odd pieces of track, mainly points and crossings, lay scattered around while the DMU service thereafter used Platform 4. The South Town - Lowestoft line was one of several now-closed lines in East Anglia and probably elsewhere for which handy little pocket timetables were produced and issued free. On thin card, they folded down to shirt-pocket size and usually also included a fare table. They are now rare and, although not of any great monetary value, do have interest among collectors of railway memorabilia. At 21:10 on Saturday 2 May 1970 the final train, a 6-car Cravens DMU, rasped away towards Lowestoft and that was the end of Yarmouth South Town’s 111-year railway history. The remaining track back to a point just short of Coke Ovens Junction was lifted soon afterwards using, photographic evidence suggests, road vehicles. Despite the line suffering peaks and lows according to season and despite it being paralleled by the Eastern Counties Omnibus Co's service 1 and its variations, the line remained well used overall, with its 24-minute end-to-end journey time, and was sorely missed for many years, but as the decades pass it is gradually fading from memory and many younger residents of the area are likely unaware that the railway ever existed. Saturday 2 May 1970 was not the final time a DMU, more precisely a part of one, was seen at Yarmouth South Town. During 1974 the writer and a friend visited South Town station and, peering into a compound beside the station building, were stunned by the sight of half a Cravens DMU driving car. On finding an office in the station building a gentleman there gave permission to enter the compound and examine the half-DMU. It comprised driving cab and passenger section as far back as, and including, the third bay. The interior had been stripped out as had most of the driving cab but certain items remained such as the engine start/stop panel and destination box. Externally the cab front retained its 2-character headcode box and marker lights, all, like the destination box, painted over. At that time painted in a light grey livery, the BR livery had been overpainted without rubbing down and the writer was able to identify the vehicle as M51729, one of the Rolls-Royce C8NFLH-engined Class 112 units, in this case a Driving Motor Composite Lavatory. Its final BR livery had been blue with double-arrow logo. A photograph was taken and this later appeared in the January 1975 edition of the Railway Magazine. M51729 was later photographed by others, by which time it had been repainted into a darker livery and was in use as a paint store. The gentleman in the office informed the writer that the DMU had been out to sea on ‘Phillips Platform’, a exploration rig. Phillips was and still is (it is now ConocoPhillips) one of several companies involved in the North Sea oil and gas industry. The writer was also informed that the DMU was one of several such adaptations but no other evidence has ever been found of any others. The use of this and other such DMU cars, if there were any others, in such an environment was probably due to their asbestos insulation. The only other known use of ex-BR Class 112 vehicles was a pair which went to Shotton Steelworks for use in that system’s breakdown train. The ultimate fate of these and M51729 is not known. Class 112 were diesel-mechanical power twins with a single 238hp Rolls-Royce engine per car and as such were alien to East Anglia. Some, however, together with the torque converter Class 113, did work on St Pancras - Bedford services based at Cricklewood. Both types were more usually associated with the north-west of England but following a mass withdrawal in 1968 nine sets of Class 112 were retained for use on Barking - Kentish Town (now the Barking - Gospel Oak line) services but M51729 was not among them. Who undertook the ‘chopping’ of M51729 is unconfirmed but it was probably A King & Sons, Norwich, to whom a number of Class 112 members were sold for scrap. In addition to M51729 there were also a few Door-to-Door containers and grounded van bodies scattered around in use as sheds. Also the embedded tracks across the south side of the forecourt which once led to the goods yard were also still present until the station site was cleared, these being the final lengths of track at South Town. The neon station name on the front of the building also survived closure and may have remained in situ until demolition although the writer has a vague recollection of this disappearing shortly before demolition in 1978. Surviving items of platform lighting have already been mentioned; in addition a Yarmouth South Town bench seat has survived at the National Railway Museum. As befitting Great Yarmouth, its cast iron ends are decorated with representations of fish, fishing nets and sea shells, Dating from GER days, quite how many of these so-decorated benches existed is not known. Today no trace whatsoever of Yarmouth South Town passenger station remains. Pasteur Road, the A1243 link road to the A12, cuts through the site and follows the trackbed south-westwards. Beyond the A12 roundabout, Gapton Hall Road occupies a short section of trackbed of the former Beccles line while the A12 itself now uses part of the former Lowestoft line north of Gorleston as well as much of the former route of the link over Breydon swing bridge (a new bridge has replaced the original demolished in 1966). The remainder of the railway at South Town is now occupied by retail and industrial premises, with the site of South Town's locomotive facilities being occupied by the premises of Schlumberger Ltd and a B&M store. After the station closed in 1970, the embedded tracks across the south side of the forecourt remained in situ until the site was redeveloped and these were destined to become the final lengths of railway track at the location. Of the goods yard, closed in January 1967, as of 2017 the site has been largely redeveloped and no evidence remains of the former railway activity. The ice house, however, still stands and is Grade II Listed. To avoid any possible confusion, the Yarmouth quayside tramway, which remained in use until the mid 1970s, was on the opposite side of the river and had no connection to South Town goods yard other than by means of a circular tour via the Breydon Water swing bridge and a reversal at Gorleston North Junction, but even this move became impossible after 1953. Further information on South Town station and its environs can be found in the image captions which follow. An overview of Great Yarmouth’s former herring fishing industry and how the railway was involved, over and above what has already been mentioned can be seen by clicking here. Minutes, records and other documents of the Norfolk & Suffolk Joint Committee; Eastern Counties Railway; Great Eastern Railway; London & North Eastern Railway; British Railways Eastern Region. Bradshaw and BR timetables as described in text. Anderson and Gillham The Tramways of East Anglia., Light Rail Transit Association ISBN 0 900433 82 5. This is an undated reprint of a 1969 publication.